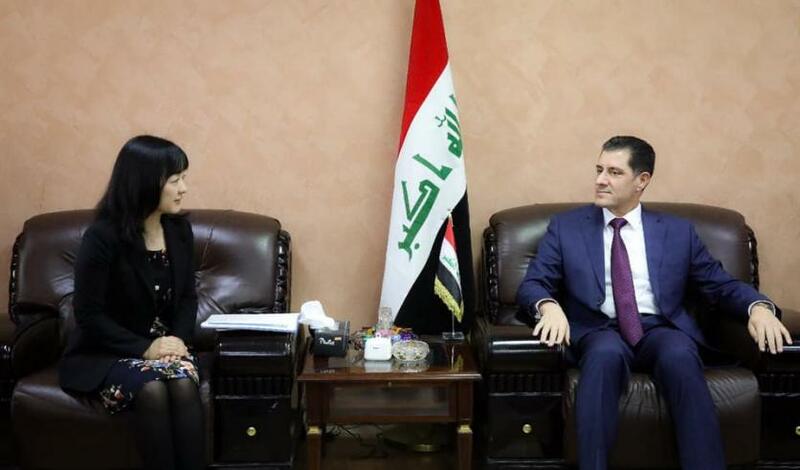 - Planning Minister Nouri Sabah al-Dulaimi discussed with UN Director-General of the United Nations Human Settlements Program in Iraq Yoko Otsuki on Tuesday the treatment of random housing in Iraq. "The Minister of Planning received today, Director of the United Nations Human Settlements Program in Iraq, Ms. Yoko Otsuki, and the accompanying delegation, and during the meeting discussed the efforts to address the indiscriminate housing in Iraq," the Information Office of the Ministry of Planning said in a statement received by Al-Ghad Press. He added that "the Minister of Planning discussed with the UN delegation, UN-Habitat, the vision of the Ministry to address the indiscriminate housing throughout Iraq, for about 3 million citizens living in these gatherings," pointing to "the importance of sustainable treatment of this phenomenon, to ensure a decent living for its inhabitants." Dulaimi said, according to the statement that "
He called on the Minister of Planning "to contribute to the development of the centers of old cities in the provinces of Basra and Nineveh, and to benefit from the strategic studies prepared by the Ministry in the field of spatial and rural development, and support the program to develop the capacity of the ministry's staff." In her turn, the director of the UN-Habitat program in Iraq reviewed "the activities carried out by the program in cooperation with Iraqi government agencies and international organizations," stressing the full readiness "to provide more support to the Iraqi government in the field of treatment of random housing and rural development in the Iraqi provinces, Recovery and stability in liberated areas ". The Minister of Planning, Dr. Nouri Sabah Al-Dulaimi, received on Tuesday the Director of the United Nations Human Settlements Program in Iraq, Yoko Otsuki, and the delegation accompanying them. The Minister of Planning and the UN delegation discussed the ministry's vision to address random housing throughout Iraq for about 3 million citizens living in these communities, pointing out the importance of sustainable treatment of this phenomenon, in order to ensure a decent living for its residents. Dr. Nouri al-Dulaimi said that the ministry has started preparing all the preparations for launching the economic and social survey of the slums in Iraq and in cooperation with the governmental and international bodies to add this effort to the Ministry's projects to the House of Representatives, which included mechanisms for treatment and rehabilitation. .
During the meeting, the minister praised the efforts made by the United Nations programs in support of reconstruction and stability operations, while calling for contributing to the development of the old city centers in the governorates of Basra and Nineveh, and benefiting from the strategic studies prepared by the ministry in the field of spatial and rural development, And supporting the capacity development program for ministry staff. In turn, the Director of the UN-Habitat program in Iraq reviewed the activities carried out by the program in cooperation with the Iraqi government agencies and international organizations, stressing the full readiness to provide more support to the Iraqi government in the field of treatment of random housing and rural development in the Iraqi governorates and work to support recovery and stability in Iraq. Liberated areas. Mr. Najla Ali, Director General of Regional and Local Planning, Dr. Mohammad Mohsen Al Sayed, discussed the launch of the electronic platform for development and reconstruction, and signed a memorandum of understanding to enhance cooperation between the two sides.